This is the third blog in a series of three summarizing Alex&apos;s experiences at the inaugural Indiana Dunes Birding Festival. Read the first post here and second post here. My final day of the birding festival was cold and rainy. “Shorebirds at McCool Basin” was the tour I headed on this day. We had to carpool from the Indiana Dunes Visitor Center to Wolf Lake Memorial Park in Hammond. I decided to drive my carpool team since I was one of the birders who knew the area the best. I was fortunate enough to have three wonderful women in my car with me from Fort Wayne. A mother and her two daughters had traveled to the South Shore for Mother’s Day as a gift to their birding mother. When we arrived at Wolf Lake, it was white-out foggy and icy cold. There weren’t many birds to be seen due to the weather. It had rained the previous night so the water levels had risen to a level not optimal for the shorebirds we were looking for. We were able to spot an American Coot, Caspian Tern, Great Egret and an American Kestrel. I was still quite impressed by Wolf Lake. I’ve been by it many times, but I never thought I could be as close to the birds as the group happened to be. It was exciting to learn of yet another location to bird. The tour soon took us to McCool’s Basin, otherwise known as “McCool’s Pool.” Due to the weather, we were not able to see many birds at this location, either. The tour ended and I took the ladies with me back to the Indiana Dunes Visitor Center, but not before we took a little side trip. On our way back, I decided to drive by the Chesterton European Market located in downtown Chesterton. The ladies were very interested in the market, so we stopped to look around before grabbing some lunch. The ladies were thrilled with the market and were excited about being able to go and try something new. We headed back to the Indiana Dunes Visitor Center after lunch because the ladies I was with had told me there would be a presentation featuring live raptors back at the center. I decided to stay around for the presentation and I’m happy I did. Lake Milton Raptor Center from Michigan brought a variety of raptors that had been hurt in various ways to the welcome center. 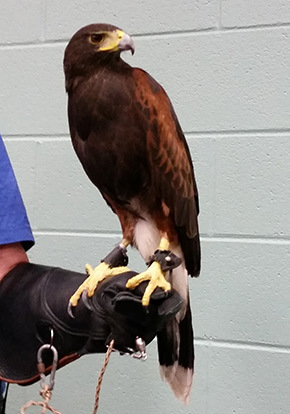 The raptors could not be rehabilitated, so the birds are brought to schools and festivals for educational purposes. Two screech owls were the first to be brought out and that made me and many other people squeal with enthusiasm in their cuteness. Yes, we all know the birds could probably do some serious damage to us if they wanted, but it couldn’t stop the cuteness! The barred owl was the next guest and it exemplified the myth that owls seemingly can turn their heads 360 degrees. In reality, owl necks don’t turn that much. Barred owls turn their heads 270 degrees because their eyes are stationary and cannot move. Next up was the barn owl. Yes, I did crack about four Harry Potter jokes during this presentation that my fellow birders thoroughly enjoyed. 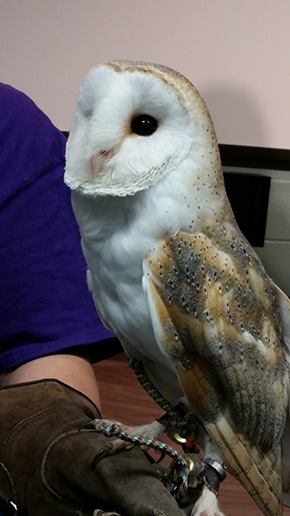 The barn owl was beautifully colored and it looked so regal! The peregrine falcon followed and it was fantastic. I learned that peregrine falcons were introduced to Chicago in an attempt to control the pigeon population. Peregrines eat other birds and they now even dine on sea gulls and songbirds. The next time you are in Chicago, thank the peregrine falcon for how great it is that there aren’t as many pigeons making you trip. The Harris hawk, a very different type of raptor who hunts in a pack much like wolves, followed the peregrine falcon. One of the handlers of the Harris hawk actually uses this hawk in Falconry - a sport consisting of raptors used to catch live game. A turkey vulture, which I’ve always thought was a weird type of bird, was the next bird displayed and it’s now one of my favorite birds. Though it has a strange appearance, it’s vital to our ecosystem due to its ability to digest decaying corpses with the help of some interesting defense mechanisms. 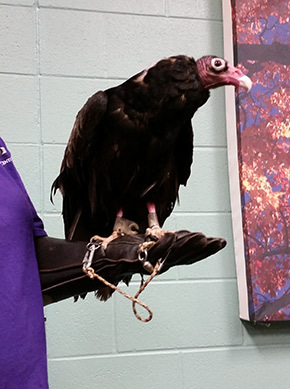 I find the turkey vulture much more loveable after meeting this bird in person and hearing more about it. Last, but of course not least, was the golden eagle. 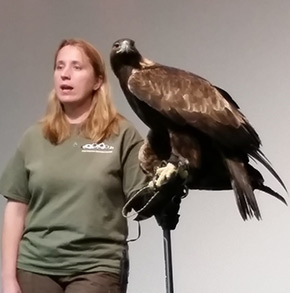 This massive and majestic bird made the audience gasp in awe with its presence. I almost couldn’t believe that birds this size exist and live in Indiana. Yes, eagles do live in Indiana! Golden eagles are known to attack prey as large as deer and cattle. The bird was so big that the handler could not walk around with her. The handler had to prop her arm and the golden eagle on a type of stick. At the end of the presentation, the handler took out numerous birds and let people get close enough to take pictures and ask questions. I got a little too close in retrospect and definitely could have lost an eye or two, but thankfully the raptors were banded to the handlers. It was really neat to see the birds up close and I made sure to get lots of pictures! Great presentation! The last event for the night was dinner and a presentation by James Currie, the keynote speaker, titled “Not Your Grandma’s Audubon.” The presentation was held at the Spring House Inn in Porter, which is nestled right outside the Indiana Dunes National Park. There was a silent auction and various vendors in attendance for my fellow birders to buy items from throughout the night. Once I found a seat, dinner was served. There was a couple at my table with their grandson who had been on various tours with me throughout my last few days, and four other women. One of the women was from Michigan and she had been birding for many years before deciding to have a little getaway to the Indiana Dunes Birding Festival. She taught me many tips and tricks, and even showed me some apps and other websites that are great for learning more to become an expert birder. The keynote speaker, James Currie, began his presentation after dinner. Currie is the host of the television show “Nikon’s Birding Adventures TV.” Currie spoke about the various birds that he had found from all over the world. He spoke about finding birds ranging in location from Israel to Peru, and showed various clips from his show that revealed how he found these birds. He was such a charismatic and a genuinely friendly guy. The silent auction ended after the presentation and I took my winnings home to sleep off a great day. I genuinely loved my time at the Indiana Dunes Birding Festival. One of my favorite parts of the festival was meeting all the different birders. No birders were shy and they all wanted to talk and learn from each other. I met some really great people during my time at the festival and it makes me feel confident to be in such good company. Anyone who knows me would tell you that I’m not a shy person. I do have some doubt in myself at times, especially when it comes to my birding. This festival completely energized me to continue birding and to really expand my horizons to be more than a backyard birder, which is still nice, too. It makes me want to put on my hiking boots, grab my binoculars and explore what the South Shore has to offer for birding. I am now a true birder. Former Visitor Services Manager with the South Shore CVA.